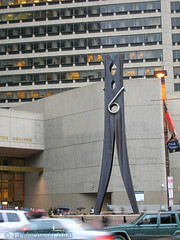 World's Biggest Clothespin - Ramblings of Mad Shutterbug & the Border Collie Bros.
And thus was one of my photographs on Flickr discovered. Or, yanno, something. This peecture blogged in place of something like actual constructive content. Are you imagining it... applied to someonething? I should expect so. *G* Even a normal size clothespin.